Most of the team at the clinic know the spell I’m under when it comes to my daily coffee. The exotic aromatic blends, the creaminess of the milk and most of all the blissful TIME OUT! From school drop off until I reach my cafe destination, I’m creating a mental oasis of my perfect coffee for the day. Though you probably know it’s not all about the coffee, that’s just part of the experience. It’s really about the magical time I invest to center myself and tune into my successful day. The one thing that I deeply value is being the creator of my reality. I’m not leaving it up to someone else to choose for me, so I spend at least 20 minutes a day, everyday (usually in the morning) to create 3 valuable lists whilst I take pleasure sipping my cappuccino. 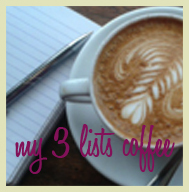 This simple 3 list process has proved ongoing success for me and many of my private clients that I see in my Kinesiology practice, so I thought I’d share it with you just in case you also love coffee, time out and are looking for a way to design your spectacular life. See, it’s easier to achieve all your goals (any goal for that matter) once you have first eliminated all the beliefs, thoughts and negative feelings that convince you your goals or your life in general, are too difficult. List exactly what you’re letting go of and be specific, from that nagging thought to those cork wedge shoes you’ve been hanging onto since the 70’s. Cleansing is a wonderful way to open space for new to arrive so write about everything you know it’s time to say goodbye too. You could even declare “I fully and freely release everything and everyone on this list”. Sound easy? Funny, this is where my clients always get caught out. “But Jules I don’t know what I want!” Great, write out what you don’t want then reverse each one, something like this. “I don’t want to wake up tired and sluggish anymore” to “I wake up every day refreshed and enthusiastic”. Again, your creation list needs to be clear and specific including a timeline for completion. “I will do a 20 min work by 3pm today” or “this week I’m doubling my income”. This creation list can range from short term to long term goals. Put you hand over the list and say “Thank you for immediately supplying everything on this list”. Nothing new to me you’re probably thinking. Well, it’s just to make sure you really appreciate and love ‘what is’ before your NEW arrives. The other day my husband Jeff caught me whining about my frequent toilet breaks since I increased my intake of water. In his frank loving words, he reminded me, “1st world problem too much water, 3rd world problem not enough”. That definitely broke me out of my trance state. “Thank you, Jeff, Thank you body and Thank you mind. Thank you, thank you, thank you”. Be sure to handwrite and review your lists throughout the day. Read them aloud perhaps even modify them if you feel. More importantly keep it sacred in your heart let it be a secret between you and the universe. You may like to post your gains on our Facebook page we would love to hear about it all. Until then, happy creating and see you soon for coffee!